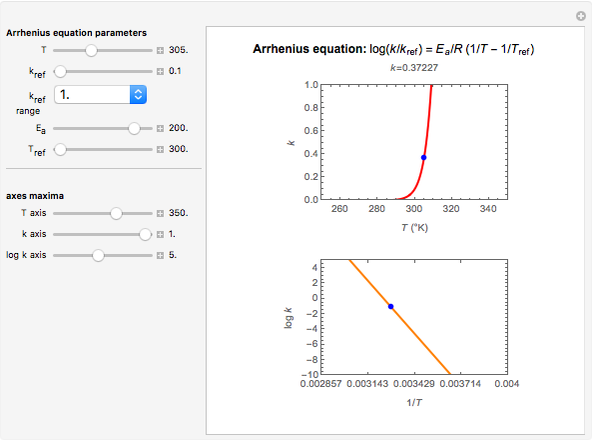 This Demonstration considers the effect of temperature on the rate of processes obeying the Arrhenius equation, specifically chemical reaction rates and fluid viscosity. We plot the reaction rate or viscosity as a function of the energy of activation. It is shown that increasing the temperature can accelerate chemical reaction rates and lower the viscosity of fluids. 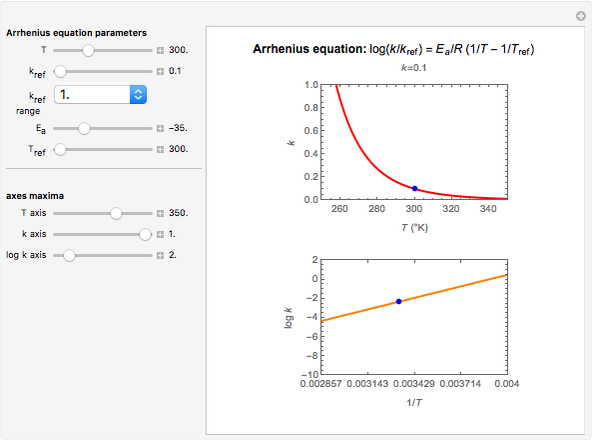 This Demonstration shows the temperature dependence of reaction rates or viscosity according to the Arrhenius equation, , where is the temperature, is a reference temperature (both in K), and are appropriate parameter values at the respective temperatures, is the "energy of activation" (in J, kJ, cal, or kcal per mole), and is the universal gas constant. If is positive, as in most chemical and biochemical reactions, rises with temperature; if negative, decreases with temperature, which is usually the case for viscosity. The Demonstration plots the versus relationship on a linear scale (top), with the corresponding versus plot (bottom). The value of at the chosen temperature is shown as a blue dot on both plots and its numerical value is shown above the top plot. The values of the parameters can be entered directly or by moving the slider. The maximum value of the , , and axes can also be adjusted. The order of magnitude of may be selected from a popup menu. Not all allowed settings produce plots that correspond to physical systems. D. Purich and R. D. Allison, Handbook of Biochemical Kinetics, San Diego, CA: Academic Press, 2000. G. Drobny, P. Reid, and T. Engel, Physical Chemistry for the Life Sciences, Upper Saddle River, NJ: Prentice Hall, 2008. 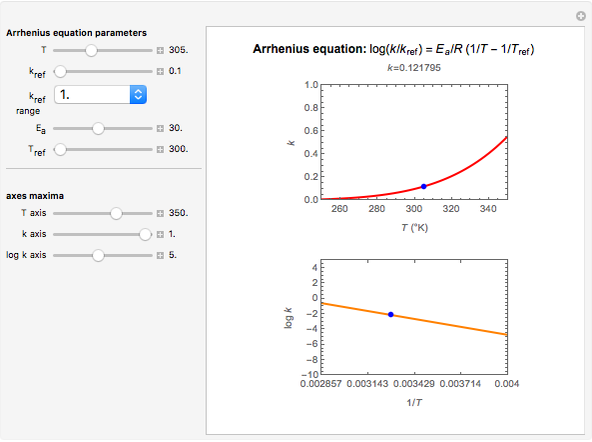 Mark D. Normand, Maria G. Corradini, and Micha Peleg "Arrhenius Equations for Reaction Rate and Viscosity"